Bumps Are Gone But He's Still King! 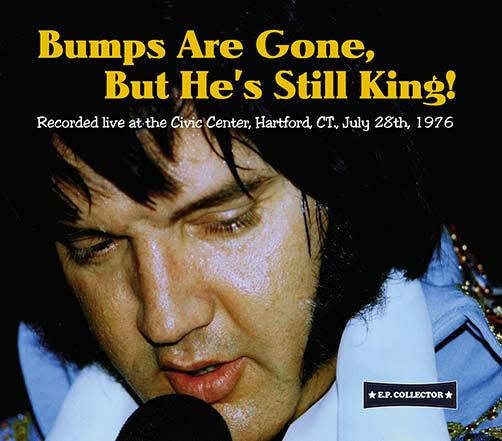 Our new CD is titled "BUMPS ARE GONE BUT HE’S STILL KING! (E. P. Collector label, catalogue number EPC 2018-19). The Hartford, July 28th, 1976 show is previously unreleased in complete audience recorded form. Audionics label released parts of this show taken from soundboard source (CD "Across The Country," 2005). Unfortunately, complete soundboard recording of this concert do not exist. The E. P. Collector label had complete audience tape of very good sound quality in vaults for many, many years and finally decided to release it. July 28th, 1976 is longest and perhaps the best show from this particular tour. Among the concert highlights there are fantastic performances of ,,Jailhouse Rock“, „America“, „Polk Salad Annie“ and „Hurt“. There is one special moment too, when Elvis sing „Happy Birthday“, to Kitty Kahane, daughter of Elvis friend, comedian Jackie Kahane. This show was restored with a great care with a focus on not changing the integrity of the original monaural recording. You may ask your supplier for samples. If you are fan of good audience recordings, we bet that you will like the sound! This CD is packaged in a nicely designed digipak with concert review and collection of images taken during Hartford concert on July 28, 1976. If you have enjoyed our previous 1976 releases like „The First Time Ever I Lay With You“ and „Looked Into The Wings”, then you are sure to enjoy our latest release, too. We would like to thank you for your continuing support. We are planning some surprises for 2019, including totally new shows, so stay tuned! 01. Also Sprach Zarathustra (2001 Theme) - 02. C. C. Rider - 03. medley: I Got A Woman / Amen - 04. Love Me - 05. If You Love Me (Let Me Know) - 06. You Gave Me A Mountain - 07. All Shook Up - 08. medley: Teddy Bear / Don't Be Cruel (medley) - 09. And I Love You So - 10. Jailhouse Rock (with reprise) - 11. Fever - 12. America (The Beautiful) (with reprise) - 13. Polk Salad Annie - 14. Band Introductions - 15. Early Mornin' Rain - 16. Chicken Pickin' / What'd I Say - 17. Johnny B. Goode - 18. Drum Solo (Ronnie Tutt) - 19. Bass Solo #1 (Blues - Jerry Scheff) - 20. Bass Solo #2 (Battle Of New Orleans - Jerry Scheff) - 21. Piano Solo (Tony Brown) - 22. Electric Piano Solo (David Briggs) - 23. Love Letters - 24. School Day - 25. Happy Birthday (to Kitty Kahane) - 26. Hurt (with reprise) - 27. Hound Dog - 28. Funny How Time Slips Away - 29. Hawaiian Wedding Song - 30. Can't Help Falling In Love - 31. Closing Vamp.